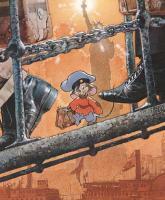 For a film aimed at kids, An American Tail is surprisingly full of historical references, human prejudices and the pain and suffering of those less fortunate. Released in 1986 it was produced by Steven Spielberg and directed by Don Bluth, the well known animator who outside of the efforts of the Walt Disney company is probably the most successful name in traditional animation alive today. The film tells the story of young Jewish mouse Fievel Mousekewitz, whose family have fled their home town after it was invaded by Cossack soliders during the Serbo-Bulgarian war in 1885, which leaves them easy prey for the cats in the area. They board a ship headed for America, which at that time was seen as a place of great hope to the poor people of Eastern Europe and Russia. The mice wrongly believe that America is free of cats, and that the streets are paved with cheese, which isn’t far from what humans in a similar predicament thought at the time – just substitute cheese for gold and your probably a bit closer. All seems good until the ship is approaching America, when a storm causes Fievel to be separated from the rest of his family. Fievel finally arrives in New York City lost and confused, and is taken in by a rat named Warren, who says he will help him out. Warren’s help is anything but, and Fievel ends up working in a sweatshop. Eventually, accompanied by his new friends Tony and Bridget he manages to escape, but things aren’t much better with his new found freedom. Have you been watching the latest series of Doctor Who on BBC1?Â Only a couple more episodes left to go!Â What do you think?Â Is it better than the original series?Â Do you like David Tennant?Â Or are you still fond of the classic years of Tom Baker?Â This weeks survey is to find out which of the various timelord incarnations from over the years is your favourite.Â How will the Doctors of the 1980’s fare I wonder? Who is your favourite Who? Jacob’s Club have been around for years and are still going strong today, but the 1980’s was a particularly popular time for them thanks mainly to the advertising campaign for them, of which more in a moment. The bars themselves come in a number of different flavours, the most common being mint, orange, milk chocolate and fruit, although I’m sure there have been others over the years. They consist of a biscuit, normally topped with a layer of flavoured cream, which has then been thickly coated in chocolate, and very tasty they are too. 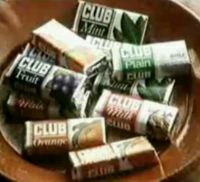 Anyway, in the 1980’s Jacob’s had a very strong TV advertising campaign for the biscuits which centred around the jingle “if you like a lot of chocolate on your biscuit join our club“. There were several different adverts made around this theme, but they followed the pattern of having one person start eating a Club biscuit and somebody starting to sing the above line. When they got to the end of the line somebody else would join in and start singing it too. Do you remember visiting your local toy shop and looking at one of those rotating display stands that was brimming with tricks and jokes? From whoopee cushions to nails through fingers the stand was loaded with little toys at pocket money prices. You don’t seem to see these as often as you did, but they are still around if you look hard enough. One of the toy jokes I distinctly remember was the Snappy Chewing Gum. This consisted of a piece of cardboard decorated to look like an ordinary stick of chewing gum when it was inserted into a standard packet of gum. The difference was that it had a sprung loaded piece of wire with a loop on one end stuck to it, something along the lines of the dangerous part of a mouse trap. Approaching your victim you would nonchalantly ask if they wanted a stick of chewing gum. When they attempted to take the gum out of the packet the trap would be triggered, with the metal wire snapping forward onto their finger with a surprisingly loud whacking sound. If you got it just right then it could actually be quite painful. This joke could only be spoiled in two ways. First, your victim refused the gum in the first place, but that wasn’t so bad because you could just seek out another person to surprise. The real spoiler was when the person took the stick of gun by using two fingers either side of the stick of gum, rather than one on top and one underneath. 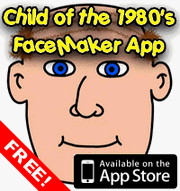 This and a range of other chewing gum related pranks are still available today from SillyJokes. If you come from outside of the UK, Ireland or several other European countries then you would be forgiven for thinking that the title of this post was wrong, and should in fact be Ninja Turtles. Well, these days that is definitely the case, but back in the mid 1980’s, when the Turtles cartoon first aired in the UK it was renamed because the word Ninja was seen as being too violent to be associated with a childrens TV programme. Luckily this didn’t really effect the cartoon too badly. Other than a change to the logo and a few changes to the theme song the adventures of Raphael, Donatello, Leonardo and Michelangelo were relatively untouched by the censors scissors, at least as far as I’m aware. Michelangelo did have some nunchuks, which were banned in films and on TV for many years in the UK, even in adult films (most notably Bruce Lee’s Enter The Dragon, which suffered a fairly heavy cut) so there may have been a few scenes cut here and there involving those, but given these would have only been fight scenes the storylines and humour of the series would not have been compromised too much. 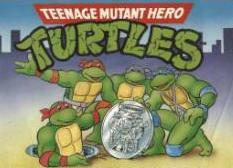 Originally the Turtles started life as comic book characters, but it wasn’t until the cartoon series appeared in 1987 that Turtle Power really hit the big time and they became a merchandising sensation stretching to action figures, films, videogames and all the other associated things like pencil cases and lunch boxes. More on some of these another time perhaps, but for now we’ll concentrate on the cartoon. I’ve always enjoyed the books of the late Roald Dahl, and indeed Charlie and the Chocolate Factory is still one of my favourite books even now. Roald Dahl has a way of writing that just appeals to kids because of all the larger than life characters he creates. Whilst the cast of his stories might be weird and wonderful, they are still somehow believable. The Twits was the first book to be published by Dahl in the 1980’s, and one of the first to be illustrated by Quentin Blake. Indeed I believe Mr. Blake has gone back to most if not all of Dahl’s childrens books and reillustrated them in his sketchy style, which for most of the books is an ideal match. Mr. and Mrs. Twit are the titular Twits that the book is about, and neither of them are particularly nice people, even to each other. Mr. Twit has a horrible matted beard that traps fragments of all the food he eats, thus providing an emergency snack when necessary (urgh! 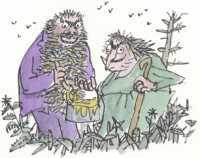 ), whilst Mrs. Twit is a bent over old hag of a woman who uses a walking stick and despises children. They go through life being mean to anybody and everybody, and have a habit of playing practical jokes on one another. Donkey Kong is one of the first examples of the popular platform game genre, and its just as playable now as it was when it first appeared in the arcades back in 1981. It is also a bit of a landmark in videogame history because it was also the first of many adventures for Nintendo mascot Mario, although in typical Japanese style he was originally called Jumpman! His name may have been different, but the player character certainly looked like Mario, and given that Donkey Kong was created by Nintendo’s Shigeru Miyamoto, its pretty safe to say that it was Mario to all intents and purposes. The aim of the game is to rescue damsel in distress Pauline (nope, it wasn’t Princess Peach, Mario had yet to become an inhabitant of the Mushroom Kingdom at this point) who had been kidnapped by Donkey Kong, a giant ape in the style of King Kong. 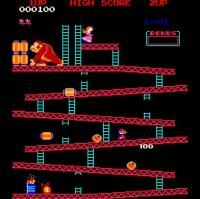 Donkey Kong got his name thanks to a Japanese to English dictionary. A word meaning stubborn was required, and donkey was the suggestion, presumably in relation to the phrase “stubborn as a mule”. Mario’s, sorry, Jumpman’s task was to try and rescue Pauline by getting from the bottom of the screen to the top, running along girders, jumping and climbing ladders. The game was split into four distinct levels, the first of which involved running up a set of girders joined by ladders. To try and stop you Donkey Kong was hurling barrels down the screen, which could either be jumped over or smashed with a hammer. The problem with the hammer was you couldn’t climb ladders whilst holding it, so I always used to ignore it. Reaching the top before the timer ran out completed the level, but Kong would grab Pauline and head up higher. Which Type of Lego Did You Play With Most? There can’t be a kid in the land who hasn’t built something out of Lego at some point in their life. Lego has always been a firm favourite of mine, simply because you can use it to create anything you want. There have been many kinds of Lego over the years, but the late 1970’s and early 1980’s saw the introduction of the familiar poseable Lego man that is still in use today. So, were you a Lego Town kid, did you prefer Lego Space or were you more of a Technic fan? Let us know!